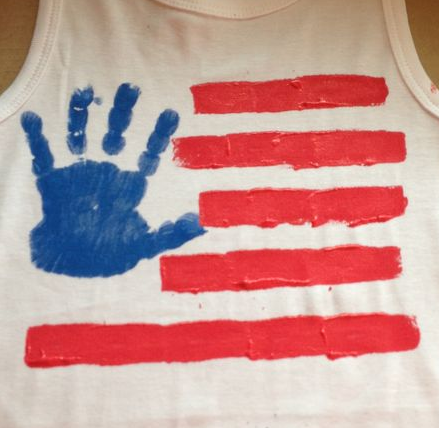 Melissa shared this fun handprint flag idea on Pinterest. She used it to make a fun 4th of July shirt, but it would be an easy way to decorate the kids table for the 4th of July too! Some white butcher paper and paint and you could create a faux placemat flag right on the paper table cloth. Of course, if you don't mind a mess, it would be a fun craft for the kids to do on the 4th too! They could personalize their own spot on the table. You can see Melissa's handprint flag shirt on Pinterest.